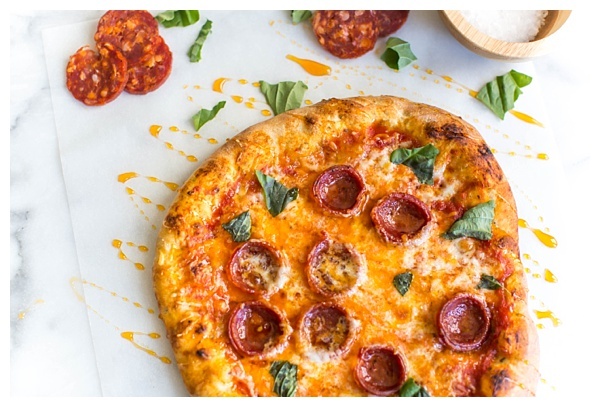 Hot Honey and Soppressata Pizza is an unexpected but perfect twist on a traditional pizza. Sweet, spicy and completely mind-blowing! When I tell people that I grew up in northwestern Ohio, they assume I grew up on a farm. It’s true that the area is agriculturally rich and Perrysburg is surrounded by fields and farm lands. But, in actuality, I am about as far from a country girl as you could possibly be. The first time I even stepped foot on a farm was last year. While I may not spend too much time in the fields, I do know some amazing farmers. And, trust me, there are perks to knowing farmers. For example, every December, I receive an enormous leaden package that’s full of every tomato product you can imagine. I open that box and I’m set with enough salsa, tomato sauce, tomato juice, canned tomatoes, and pizza sauce for the year. That package comes from my friends at Dei Fratelli and Hirzel Canning Company. I was introduced to Dei Fratelli through my dad who is friends with the family through a mutual love for aviation and flying private planes. Hirzel Canning Company is a fourth generation family-owned business based in northwestern Ohio. The company was started by Carl Hirzel in 1923 and his first product was sauerkraut sold out of wooden kegs and barrels. He then started canning the kraut, and by his third year of business, had added fancy whole tomatoes to his product line. Today, the company still produces sauerkraut but canned tomatoes and tomato products account for the majority of production. 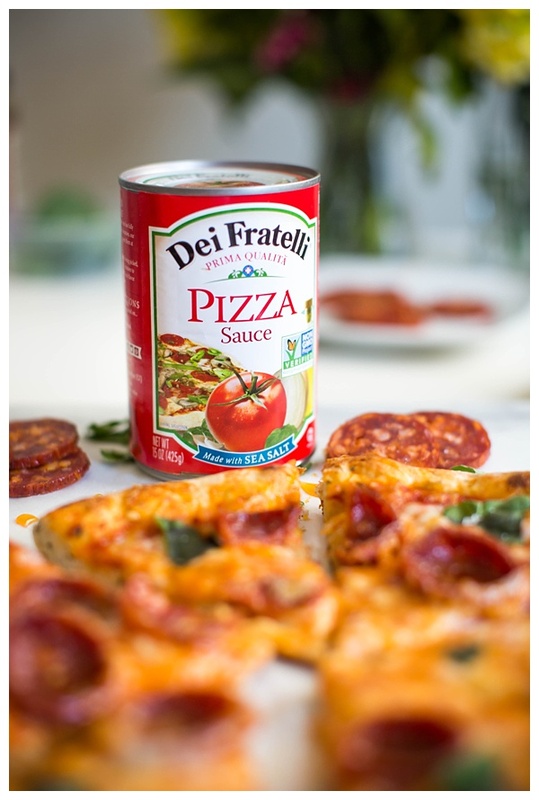 With their Dei Fratelli brand, Hirzel Canning Company uses only the finest ingredients to make all-natural tomato products. 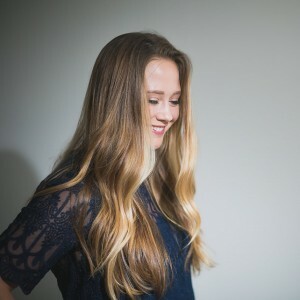 The products truly are top notch and they are staples in my kitchen. The flavors are bold and robust and I love that I’ve been to the farm and have met the farmers that are behind the ingredients. It comes in handy having a pantry stocked with tomato products, especially since I’ve been on a pizza making kick lately. I love to make dough myself, but I don’t always have time or plan accordingly. Luckily, there are several great pizza shops within a few blocks of my apartment, so I just walk over to one of them and buy some dough. Then, it’s just pizza sauce, cheese, salami, and some fresh basil from the rooftop garden. This time, I took inspiration from Paulie Gee’s Honey Hellboy and drizzled the pizza with chile-infused honey. 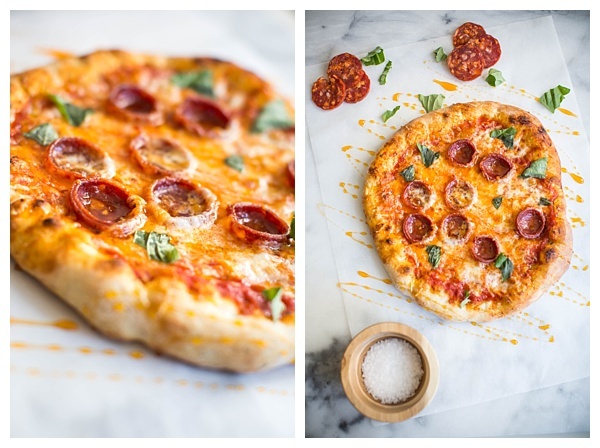 It makes the pizza sweet, salty, and spicy in a balanced way that’s completely addicting. 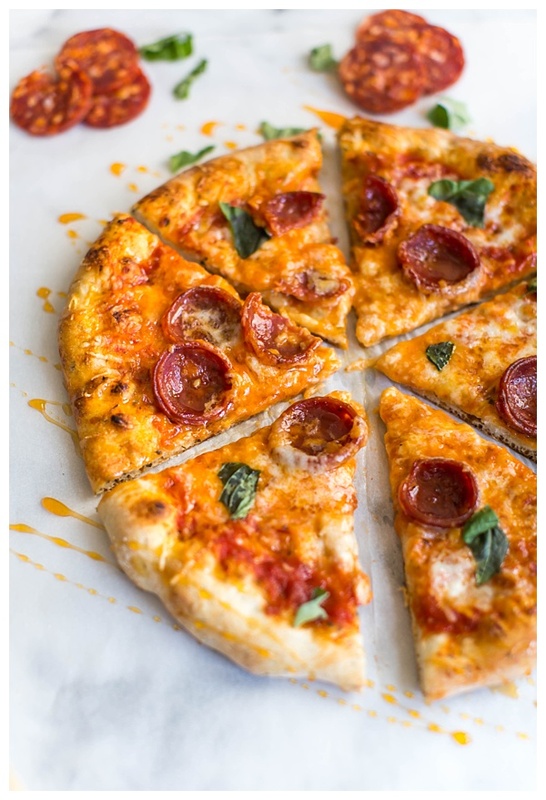 If you want to make pizza dough at home, this is the recipe I use and recommend: Jim Lahey’s No Knead Dough. Sometimes I don’t have enough time or I don’t plan ahead and can’t make my own dough. You can buy dough at the grocery store, but I go to my favorite pizza place and buy dough from them. It only costs a few dollars and it’s fresher and more flavorful than what you can buy at the grocery store. I bake all of my pizzas on my Baking Steel but you can also use any pizza stone. Here’s a great recipe for making pepperoni pizza at home and it’s a good primer for the Baking Steel. If you don’t have a Baking Steel, check out this article on How to Make Awesome Pizza at Home from The Kitchn. There are several varieties of hot honey, spicy honey, and chili honey on the market now. I use Mike’s Hot Honey but you can also whatever chili-infused honey that is available to you. You can also make your own using this hot honey recipe from Bon Appetit. 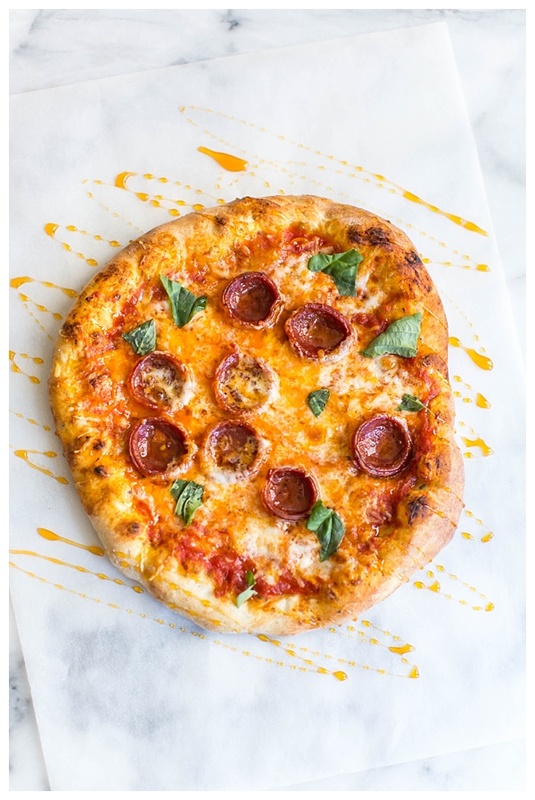 If you can’t find chili-infused honey, follow this recipe for pizza with hot soppressata, mozzarella, chilies, and honey from Kenji Lopez-Alt and use regular honey and add slices of chilies to your pizza. 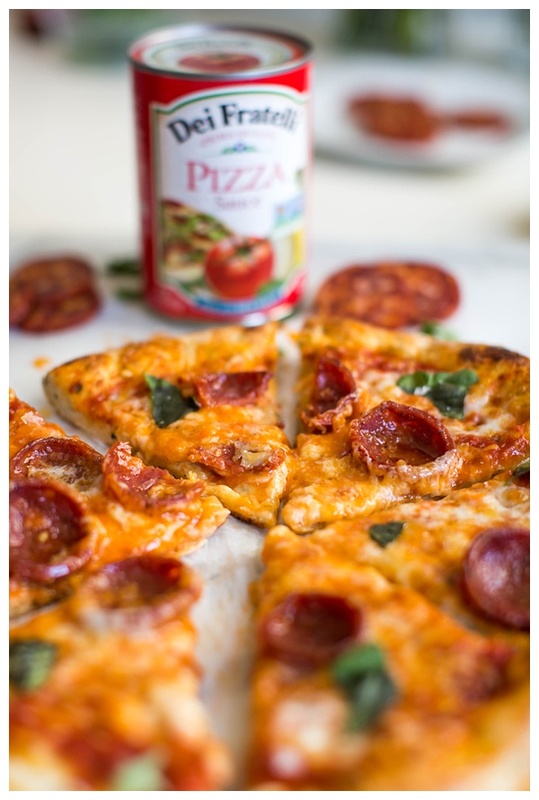 I used Dei Fratelli Pizza Sauce but you can make your own or use your personal favorite. Place the Baking Steel or your pizza stone on the top rack of your oven. Turn the oven to 500 degrees F or as high as it will go. Let the oven and your steel heat for 45 minutes to 1 hour. When you’re ready to bake, lightly flour your work surface. Take half of the pizza dough and press it into a 12-inch circle. Try to keep the edges a little bit thicker in order to create a crust. The majority of the dough should be about 1/4-inch thick with the outer edge closer to 1/2-inch thick. Don’t worry if it’s not perfectly circular. It doesn’t matter! Transfer the dough to a lightly floured pizza peel. Spread half of the pizza sauce over the dough, making sure to leave the outer 1-2 inches sauce free. Sprinkle half of the cheese over the pizza sauce. Top with half of the sliced soppressata. Use the pizza peel to slide the pizza onto the preheated Baking Steel. Let bake until the crust is crisp and the edges are puffed and golden brown, about 8-10 minutes. 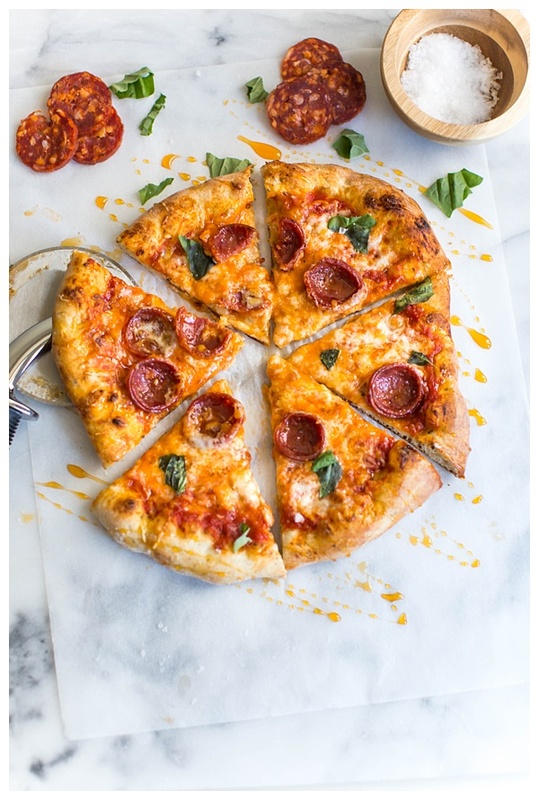 Use the pizza peel to transfer the pizza to a cutting board. Drizzle the entire pizza with hot honey and sprinkle with the torn basil and sea salt. Slice into 4-6 pieces. 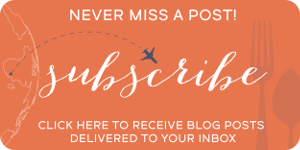 Disclosure: I was not compensated for this blog post. However, I do have a relationship with Dei Fratelli and Hirzel Canning Company and occasionally receive complimentary products. 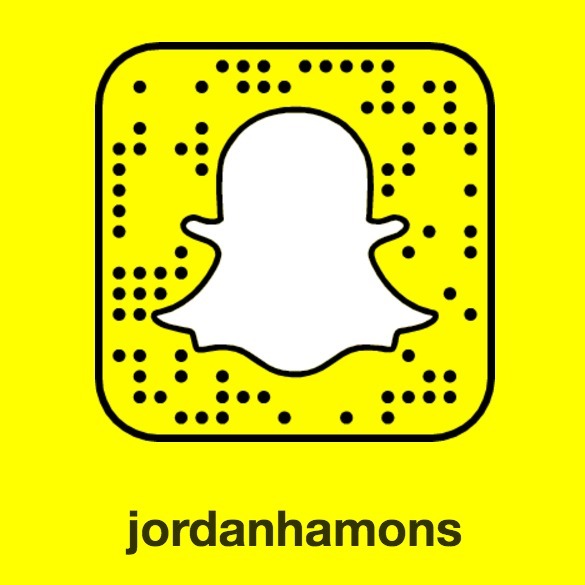 This looks outstanding Jordan! Love your style and this pizza looks so tasty. Well done!